Black pure chiffon Aline shirt appealing banarsi embroidered fabric implemented on bodice which embellished with embroidered line. Floral motif done under the bodice. Embroidery using thread, tilla sequins, beads etc. Same banarsi fabric used on hemline and antique lace implemented before appliqued hem. Golden silk used as lining under black chiffon. Dull golden pure raw silk capri pants. 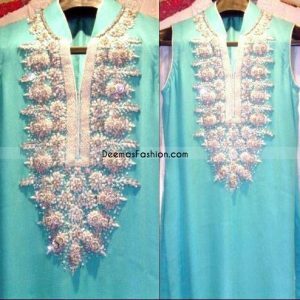 Sea Green banarsi chiffon dupatta.